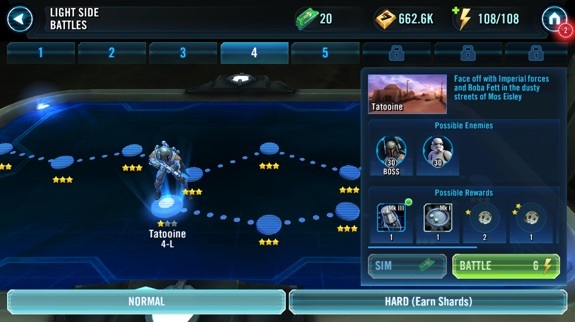 At the height of Star Wars mania in late December and feeling somewhat disappointed with Star Wars Battlefront, I saw Galaxy of Heroes listed on the App Store and downloaded it, never expecting to actually play it. A few weeks later, still not having touched it, I decided to give it a go merely so I could free up some space on my phone. Expecting to play it for no more than a few minutes, I found myself finally ready for a break three or four hours later. 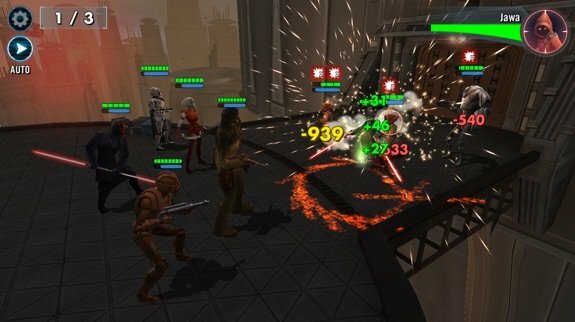 Put simply, Galaxy of Heroes is an RPG where you collect various Star Wars characters—everyone from the more mundane Stormtroopers and nameless Rebel soldiers to Han Solo, Boba Fett, HK-47, and Darth Sidious—and do battles against other groups of characters. This plays out in standard, turn-based JRPG style, with characters using a mixture of basic attacks and special skills (healing abilities, grenades, force lightning, and so on) to eliminate the competition. Missions typically last no more than a few minutes, making it well suited to quick pick-up-and-play sessions. There's no story to speak of; you play through a series of increasingly difficult missions with your teams (you start out with a Light side team before also amassing a Dark side team) to earn various rewards, including new characters. Initially, it seems as if there won't be enough to do. While you will go back to replay old missions to earn additional rewards—either choosing to play it yourself or have it automatically simulated by spending a consumable resource—there's not necessarily a great sense of variety initially. But as you play, new ways to play are introduced that keep things interesting. 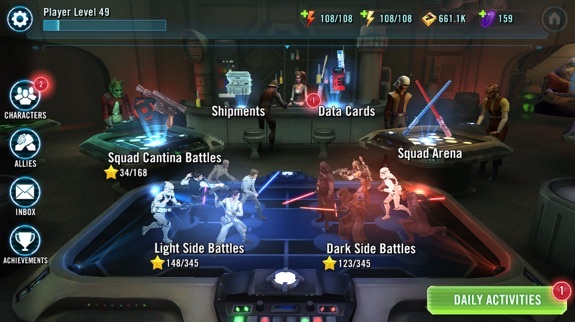 Aside from the Dark side battles that let you build a team of evildoers, there is Squad Arena (play against a computer-controlled version of another player's team), Squad Cantina (mix Light/Dark characters to tackle specific lineups of enemies that might call for different strategies), Galactic War (fight a series of battles where your characters' health persists from round to round), and Challenges (a rotating series of difficult missions that call for certain strategies to complete). These are wisely unlocked at a quick-enough pace that avoids overwhelming you but prevents any malaise from setting in during the first few hours hours. Likewise, during the early stages your account level increases quite often, rewarding you with enough bonus energy that you can play for a good amount of time before the game's energy system forces you to take a break or pay up. Whatever mode you're playing, you're rewarded with a mixture of items that characters can equip, shards that go toward unlocking new characters, and materials for enhancing abilities. Unlocking new characters and improving your existing ones was always my main motivation for moving forward, though these systems aren't perfect. Equipping your characters with new gear presents a linear path. Each character has six item slots, and each of those has a pre-defined item that can be equipped there—you don't get to select from different items to choose what stats you want to improve. This is perhaps because gear is somewhat disposable—filling up all six slots lets you consume those items to provide a permanent power boost, and lets you begin equipping even better gear—but it does seem like a missed opportunity for players to get some sense of customization. Instead, that customization comes in the form of deciding which five characters will fill your group. While the basic Light/Dark battles don't necessarily demand anything more than a brute force approach, the multiplayer battles and Challenges, in particular, require you think things through. Certain characters have synergies with others (like Jedi receiving buffs based on how many are present), some do additional damage against certain types of enemies (Darth Maul is a Jedi killer), and others have abilities (like being able to prevent healing) that can prove crucial depending upon whom you're asked to defeat. All of this is to say the game does a good job of incentivizing you to have more than just a single group you throw at any given opponent. There are some nagging issues that I wish would be resolved. Battles don't present you with enough information—there's no way to see mid-match who is capable of healing, how many turns are left until someone can use an ability, or, most frustratingly, who takes the next turn. Each character has a bar that fills as they approach their turn, but these can often appear to be identical, and not knowing the precise order turns decision-making into something of a crapshoot. Additionally, the main screen doesn't do a good enough of job of drawing your attention to where it's needed, like the various stores that refresh with new items throughout the day. 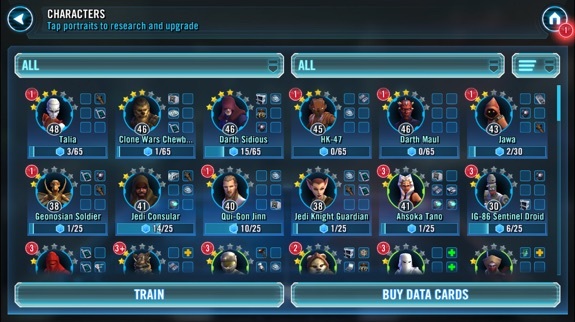 For all of my complaints, though, I've now played Galaxy of Heroes every single day for the better part of two months. I can't remember the last game I could say that about. GoH does a great job of being something you can pick up, play for a few minutes, and make meaningful progress, though I find myself devoting at least half an hour a day to it so that I can advance in all areas of the game. Whether it has the legs to keep me playing a few months from now is unclear, but for now I remain intent on continuing to grow and improve my collection of characters. You can get Star Wars: Galaxy of Heroes for free, right now.